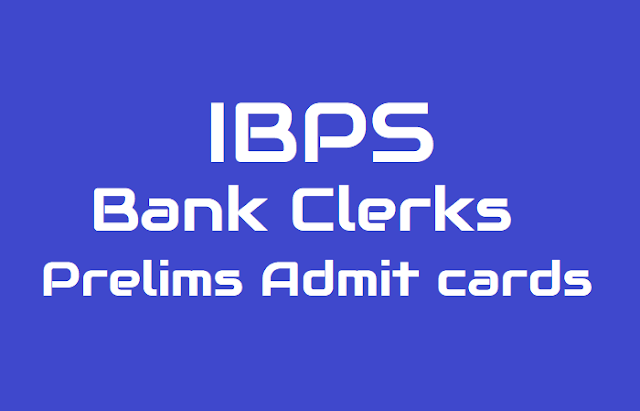 IBPS Bank Clerks Recruitment Prelims Admit cards 2018 (Pre-Exam Training Call Letter), IBPS Clerk Prelims 2019: Admit cards for prelims @ ibps.in: IBPS has released the admit cards for Clerk Prelims exam 2019 on November 14, 2018. Candidates have to visit the official site of IBPS at ibps.in to download their respective admit cards and get update on admit card and other details. Candidates can download the IBPS Pre-Examination Training Call Letter for Clerk Exam. IBPS Clerk Prelims Admit Card 2019: IBPS will release the admit card for Clerk Prelims exam very soon. The IBPS Clerk Prelims 2019 exam will be conducted across the country on December 8, 9, 15 and 16. Candidates have to keep checking the official website at ibps.in to download their respective admit cards. The examination date, shift and centre would be published on the admit cards. Also, candidates are required to download the admit card from the official website ibps.in. No copies of the admit cards would be mailed to the candidates. To download the admit card, go to the official website ibps.in. On the home page the link for the CRP Clerk VIII 2019 Preliminary Examination Admit Card would be activated. Click on the link. On the new window that opens, enter your registration number and password (your date of birth) and submit to access your account and download the admit card. IBPS would be conducting the preliminary and main examination for recruitment in the clerical cadre. There is no interview round for IBPS Clerk. However, candidates would have to prove language proficiency for the region they have opted for. IBPS Clerk Prelims Admit Card 2019 to Release on the official site at ibps.in: IBPS will release the admit card for IBPS Clerk Prelims 2019 exam. The examination will be conducted on December 08, 09, 15 and 16, 2018 at various centres across the country. Candidates who have filled up the form and are shortlisted to appear for the examination can download the admit card from the official site of IBPS at ibps.in. The examination will fill up 7275 posts of Clerks across the country at all the banks enlisted under IBPS. The Main examination will be conducted on January 20, 2019 and the provisional allotment of the selected candidates will be done in the month of April 2019. As per the official notice, the Preliminary examination will comprise of English Language, Numerical Ability & Reasoning Ability. The time duration for each paper is 20 minutes and will carry 30 marks and 30 questions in English Language and 35 marks and 35 questions in other two. Candidates will have to appear for the examination 30minutes before the exam begins. Other related details will be available on the official site of IBPS. ➞ The IBPS Clerk Prelims 2019 written examination will be conducted December 8, 9, 15 and 16, 2018 at various centres across the country. ➞ The Main Examination will be conducted on January 20, 2019. ➞ The provisional allotment of the selected candidates will be done in the month of April 2019. ➞ A total of 7275 Clerks will be hired for different banks that fall under IBPS. ➢ The Preliminary examination will comprise of English Language, Numerical Ability & Reasoning Ability. ➢ The time duration for each paper is 20 minutes and will carry 30 marks and 30 questions in English Language and 35 marks and 35 questions in other two. Step 4: After login, candidates will be able to download the call letter of the prelims examination. Candidates can visit IBPS official website for know more about IBPS Clerk 2019 exam.